The number of spectators to performances of amateur theatre groups totalled roughly 33 thousand in the theatrical season 2013/2014, which is almost on a pair with the previous season. This equals each individual attending a performance by the groups once a year. 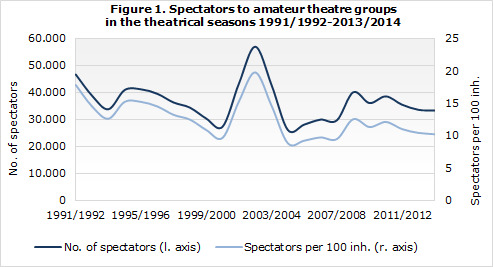 Lately, after an increase for some years, there has been an insignificant decline in the number of spectators (see figure 1). 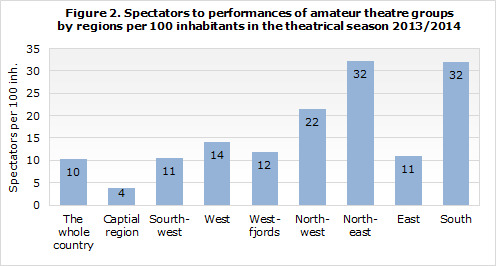 Attendance to performances by amateur theatre groups varies highly between regions. The number of spectators per capita is by far the highest in the regions of the North east and the South, or three of every ten residents, compared with only one of every ten for the whole population of the country. Spectators were fewest in the regions of the East and in the Southwest, or one of every ten of the local population (see figure 2). Stage productions by amateur theatre groups in the last theatrical season numbered 69, which were performed 483 times. Three of every four productions contained work, one or more, by an Icelandic author. The total number of performers was over 1,300. The number of amateur theatre groups has declined about half since the early-1990s when their number reached an all-time high. 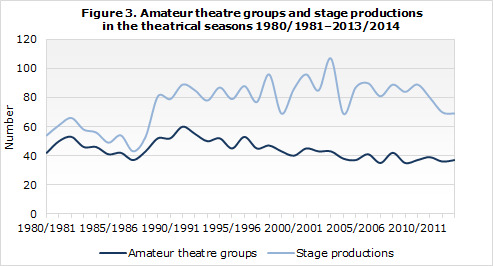 In recent years, the number of amateur theatre groups has been little less than 40 (see figure 3). Statistics Iceland collects annually information on amateur theatre groups. The information is derived from the database of the Association of Amateur Theatres.